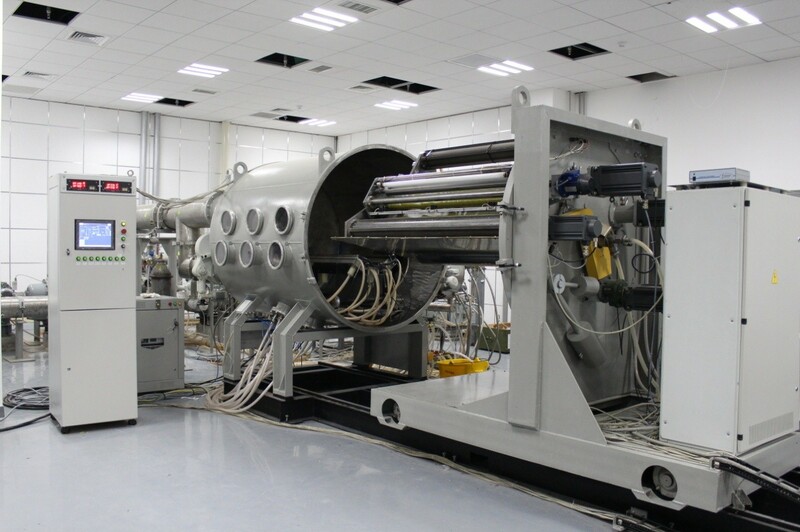 The magnetron rolling coating facility is intended for the deposition of metal coatings as well as their oxide, nitride and carbide compounds on the flexible polymeric roll materials (Kapton, FEP Teflon, Mylar, etc..) for the thermal insulation of space objects and the production of a new generation of flexible solar cells. The facility provides: high-vacuum pumping, pulling and rewinding of roll materials, production of necessary gas medium (required for the technology process), plasma cleaning and activating of roll materials surface (before coating deposition), deposition of coatings by means of the system of the magnetron sources, processing control (including coating thickness control) in real time. A.G. Ivanov, D.A. Karpov "Optimization of the technology process of functional coatings deposition on roll materials by magnetron sputtering in the large-scale vacuum facility" (Proceedings of the 16th International Scientific and Practical Conference "Hardening technologies, coating and repair: Theory and Practice", SPb . : Publishing house of the Polytechnic University Press, 2014, part 1, pp. 232-238).